Despite my best effort, cleaning is simply not my “thing.” I realize it’s probably not many people’s “thing.” Very few people walk around dreaming about going home and breaking out the wipes, broom, and duster to spend hours cleaning every square inch of the house. Or is that just me? Maybe cleaning really is some people’s “thing.” If so, I have a room for you, and warm bread. Please say you’ll stay! My “thing”? Well, I love my bed, fluffy pillows, and nap time. Ahh, the things that become your “thing” after embracing motherhood. Whether this whole cleaning love (AKA “thing”) is an inherited gene or inspired from browsing way too many Martha Stewart magazines, is still a great mystery to me. I love the benefits of a clean home; and I promise my family enjoys the benefits of a regularly (a word with many meanings) cleaned home. Nightly dishes are always tended to, clothes are folded when I’m not sidetracked by popsicle-making, and toilets are cleaned daily (four year-old boy, enough said). I diligently keep my house as clean as possible with an active family, eight chickens (they live outside) and two dogs. Creating the Natural Kids’ Cleaning Kit convinced my kids cleaning was their “thing.” In fact, Londyn (2) can be found at random times during the day washing walls and spraying spots on the floor. True story. So, why can’t mommy fall in love with the cleaning process? After much thought (time I probably should have spent cleaning) revelation came: I need to make the process appealing. “Appealing” was just the word I needed, the wheels turned and soon pretty pink washcloths were pulled from the back of the linen closet and vinegar was poured into a glass jar. This mom simply needed a change from the mundane white cloth and spray bottle. Enter the simplest DIY cleaning wipes EVER. DIY cleaning wipes have turned cleaning chores into my “thing.” Pretty magical, right? While these wipes aren’t really magical, they pack a powerful natural cleaning punch via pretty little towels that can be reused over and over again. When the toilet needs some TLC, simply grab a wet wipe and dance your way into that bathroom. Magical! Whether cleaning is your “thing” or your wanna-be “thing,” DIY cleaning wipes will make your house sparkle and keep your budget low with only a few simple, natural ingredients. Bonus: DIY cleaning wipes are perfect to use as homemade Swiffer pads! Simply attach a wipe to a standard Swiffer base and clean the floor. 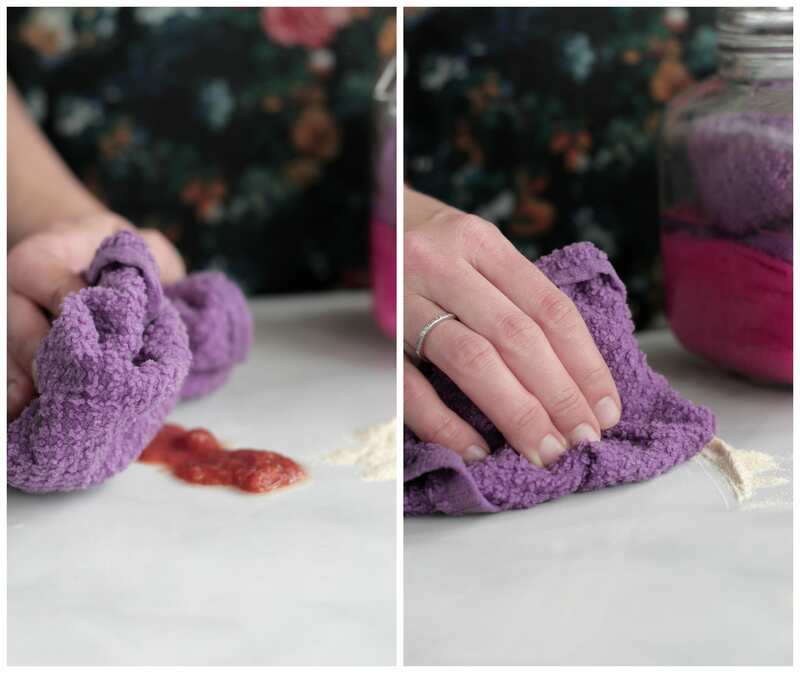 Enter the simplest DIY cleaning wipes EVER. While these wipes aren’t really magical, they pack a powerful natural cleaning punch via pretty little towels that can be reused over and over again. When the toilet needs some TLC, simply grab a wet wipe and dance your way into that bathroom. Magical! Roll the washcloths and place in a jar. In a small bowl combine the water, vinegar, and essential oils. Pour the vinegar mixture over the washcloths, pressing the washcloths down into the liquid. The washcloths should be wet. Depending on the size of your washcloths, you may need to add more vinegar/water as needed. Remove the washcloths from the jar as needed. Wash the dirty cloths in the washer, and repeat the process. Use the wipes within a week. Hi Kristin! What an awesome idea! Especially with children around! I love this! I have so many jars and rags; this will work for me! Blessings from Bama! Hey Felecia, Thank you! The cleaning wipes work so great particularly with kids around the house. Enjoy!! Just for clarification – the washcloths are dry when put in the jar? Hey Bonnie, Yes, you’re correct. 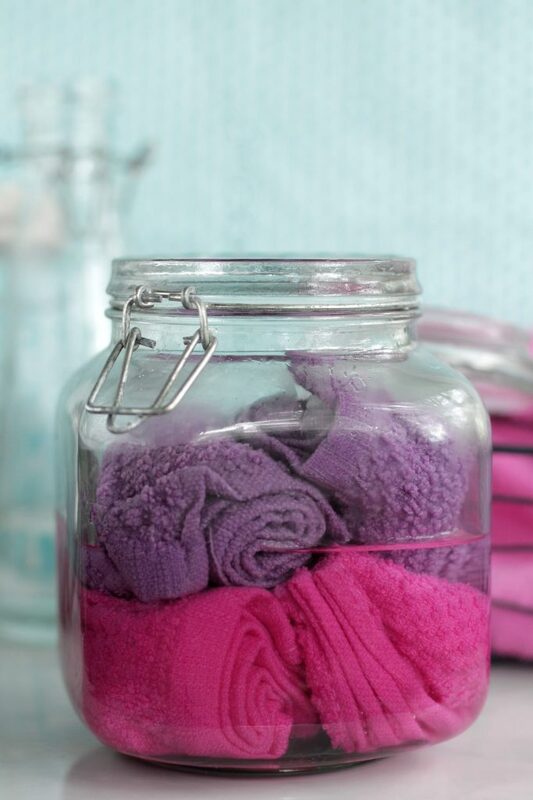 The washcloths are dry before putting in the jar and then pouring the vinegar mixture over top. Enjoy! Hi there! Awesome idea, will definitely give it a try here! 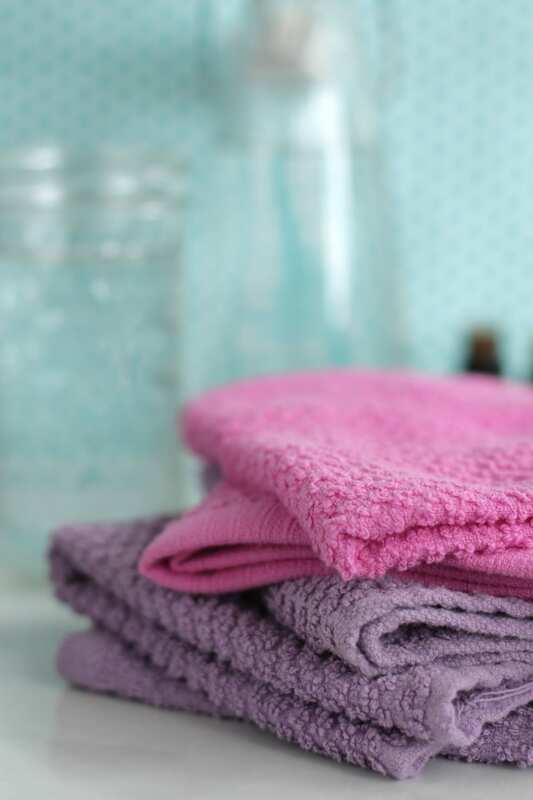 One question though…once you use one washcloth on the countertop or around the toilet seat…do you put it back in the jar to reuse or just toss in the hamper? Hey Chrissy, Thank you. Once a cloth has been used for cleaning I toss it in the washing machine and dryer. Once dry and clean I add it back to the cleaning solution, until more solution is needed to wet the washcloths. Thank you, Megan! Light-bulb moment :)! Thank you for this super idea! I just received my oils and was looking for a recipe to test them on and I found this. I made it and it works great. Thank you!! You’re so welcome, Heather! Glad you got to make and use them so quickly! Are the essential oils just for fragrance or do they have some anti-bacterial effect? And also what size jar do you use? Is a three-cup one enough? Or 5-cup to leave room to draw the towels in and out? Hey Emily, The EOs provide cleaning power (known for their antibacterial properties) and also mask the vinegar smell. I would go with the 5 cup jar just to be sure you have enough room for the towels. Enjoy!!! Any advice on where to purchase the 5 cup jars? Preferably online? Looking forward to trying this out as I try to reduce my waste footprint in 2015! Also, any particular wash cloths you recommend? Hey Allison, I always have good success finding large jars at Target. They can usually be found in the kitchen/cooking aisles. I usually purchase terrycloth washcloths (in packs of four) at Target as well. Enjoy!! Hello there! Great idea, will definitely give it a try here! I LOVE this recipe! My mom made me a bunch of pretty crochet dishcloths a while back that I had sitting around in a drawer. I finally found the perfect use for them. Thanks so much! That’s awesome, Kristine! What a great way to use the dishcloths. I know this post is a little old now but do you still use the glass jar? I’m looking for something glass to store damp cloth baby wipes in for diaper changes and this looks like it could work. So after a few months is the glass container still convenient for you? Hey Lis, I still love my glass jars for cleaning and floor wipes. They are easy to clean and hold up very well. I just saw a few in the dollar section of Target this week and thought about buying a couple more :). Hey April, I’ve been using these wipes for about nine months now and so far the towels aren’t showing any signs of being weakened. I bought terrycloth wash towels, so I’m not sure if the material makes difference with a towel vs. t-shirt. 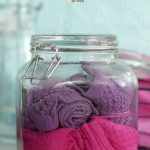 The towels usually only sit in the vinegar solution for about 3 weeks, before they are all used and washed, then returned to the jar with vinegar. Looking good! Thank you for the tip! I think my mom would be ecstatic to learn about this technique. When she first heard how hotels and restaurants have been using industrial fabric dyes to freshen-up their towels and table linens, my mom decided to recycle ours instead of buying new ones; so began the life of healthy living for us. Anyway, good job on the blog, keep it up! Awesome, Bruce! Thank you so much. I hope your mom enjoys the cleaning wipes! What is the shelf life of these? I would like to double the recipe, use a larger jar and more wash clothes. I can’t imagine even they wouldn’t all be used within a few weeks. Will they keep fresh? Hey Lynn, I recommend using distilled or boiled water for long-term use. I think the wipes should last a couple of months in the solution. I made these and LOVE them – they work great, and leave no sticky residue like those bleachy wipes you can buy… my question is, though, no matter how much EO I add, all we can smell for an hour after is vinegar. Any suggestions on that? I’ve learned to deal with it, but the rest of the family hates that smell. Thanks! Hey Paula, I’m so glad you love the wipes! Yes, these have a strong vinegar smell. Truthfully, I’m not really sure how to take that smell away expect reduce the amount of vinegar called for in the recipe. Sorry, I’m not much help with the smell :). Hi Paula, my husband also has a great aversion to the vinegar smell. I have found if I soak citrus peels in vinegar a couple weeks and then strain them out, I can use the resulting vinegar in cleaning solutions and it smells more of the Orange peels I used. Next time you are peeling an orange just put the peel in a jar and fill it with vinegar, put the lid on and let it sit a couple weeks. I’m not sure if it might color the cloths soaking in it or not but it does boost the cleaning power. My kids also hate the smell of vinegar. I found out that if I use a name brand vinegar it smells much less than a cheap vinegar. I have heard it all depends on what they use to make the vinegar in the first place – don’t know how true that is. My kids hardly notice the smell though so it’s worth the slightly higher price. I don’t suppose you ever see mold growing inside the jar? Hey Joy, I use the wipes frequently, so a new batch goes in every few weeks. If the wipes sat for months, I think mold may grow. Oh, how great idea! I have baby cotton cloths left from my daughter and they’re so beautiful I don’t want to trow them away, so I’m making cleaning wipes. I prefer cleaning with my homemade all-purpose cleaner, but I never thought of making reusable cleaning cloths. Thank you for sharing! Do you have to use glass jars? Will plastic containers work? I love this idea but I am terribly allergic to Tea Tree Oil. Do you know of a substitute for it? I make a lot of my own products because the oil is in so many things. Hey Lori, You can definitely omit the tea tree oil from this recipe :). Eucalyptus is a good substitute. It offers the same benefit needed in this recipe as the Tea Tree Oil. Hey Agricola, The rags are used very quickly–within a couple weeks. 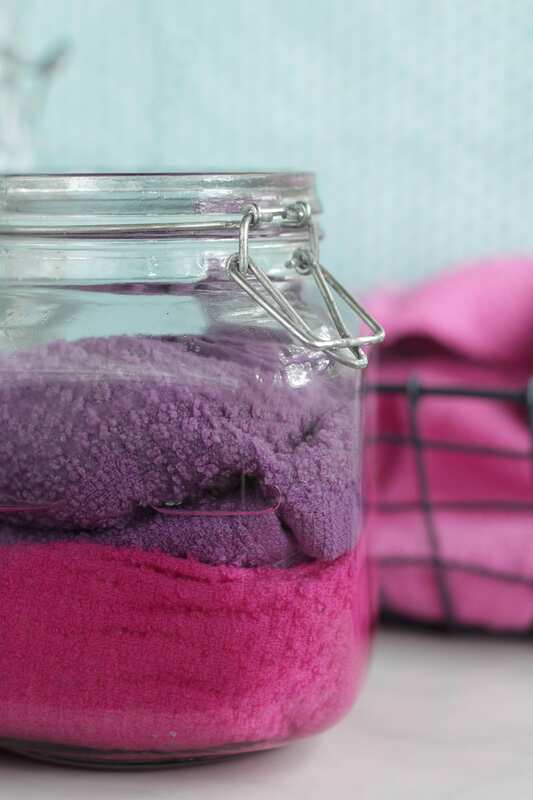 Once the rags are used, clean rags are added to the solution (a new solution usually needs to be added to the jar). I use vinegar to help take care of any mold or mildew that may pop up in our bathroom (along tea tree oil), so the vinegar should help keep anything harmful away. Hi, this sounds great but you mentioned using the rags once so you must go thru all 6 rags in one day? Hey Ana, It takes about 1 week to go through the rags in our home. You can add as many rags as needed to your solution. Hello!! Loving all your recipes and I’m venturing off today to buy more ingredients to start at least one DIY. My question is…. Why do all the containers have to be glass? Do the spray bottles have to be glass? Or can I use plastic containers. Just trying gauge where I would be better of buying products. I’m on a very tight budget. Thank you!!!! Also one last thing. I was only able to find Peppermint Castile Soap, is that ok for recipes. Thank you! I love your plan! For recipes that contain vinegar (an acid) or essentials oils (and will be stored long-term), I use glass containers. Plastic is a choice for short-term products. If you use glass vinegar bottles for cooking, you can also recycle them to make spray bottles: https://livesimply.me/2015/07/29/make-your-own-glass-spray-bottle/. Plastic bottles will also work for the majority of cleaners on my site. I also use a lot of Mason jars and purchase them from the grocery store. A pack of 12 usually costs around $9, so that may be another affordable option. They work for cleaning, beauty, and food recipes. Peppermint castile soap is great. Some people find that peppermint tingles their skin, so test it out in a skincare recipe first before using the full amount. You should be okay with just a few tablespoons of diluted peppermint castile soap in a recipe. For cleaning, peppermint is wonderful. Adorei sua dica,meu marido e alérgico e este produto é natural,obrigada. I loved your tip , my husband and allergic and this product is natural, thank you. Can this be used on granite counters? Love all of your ideas! Hey Mary, They can’t be used on granite since the solution contains vinegar. You could sub the vinegar for 2 tablespoons of castile soap to make them granite-safe. Oooh, I know that this post is a couple of years old, but I think it was written just for me! I have so much “mom guilt” over not cleaning (especially the bathrooms) but I just can’t seem to make myself do it! I think these wipes may do the trick – I’m going to make them tonight since I have an extra glass jar after cleaning out my cupboards! Ps. I think your blog may be my favorite blog ever!! That’s awesome, Laura! Enjoy the wipes :). I saw that vinegar can’t be used on granite. Any other substances that we should not use vinegar on? Hey Raye, Stone surfaces are the issue, which includes marble and granite. I just stumble into your blog by looking for handmade hand soap. Your blog is beautiful. I took the recipe and add it to my Facebook group, I translated in spanish, of course I gave you the credits and share the link to your beautiful blog. Thanks!!! Thanks for this! 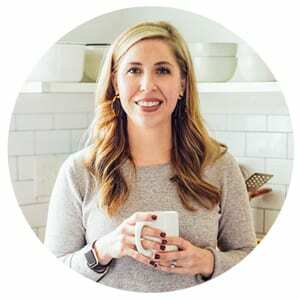 With a tight budget and our first little one on the way, I’ve been looking for natural, cost-effective ways to manage the home. This one’s a keeper! Question about the reusable wipe solution: Would it be possible to use the castile soap cleaner from your Natural Kids Cleaning Kit in place of the vinegar one used in this post? I don’t mind vinegar, but I can’t say the same for guest and other family 😉 Thank you! Hey Brittany, You can definitely use castile soap instead of the vinegar. You’ll need about 2TB-1/4 cup of csatile soap to 2 cups of water. Im glad you’re enjoying this DIY! HI! Came across your blog while looking for a natural stainless steel cleaner. I am guessing that the wipes will be moist and not wet? I really want to try this but was also wondering if using them once means using 1 wipe for each counter, appliance etc. Seems like 4 or more wouldn’t be enough….or it could be just me as I am somewhat of a cleaning freak lol. Hey Nancy, Welcome to Live Simply! I’m so glad you’re enjoying the blog. The wipes should be pretty wet, but this will also depend on the towels used. You can definitely increase the liquid mixture if the towels are bulky. Love this idea! Thyme EO makes a great addition for anti-bacterial properties or as a substitute for the tea tree oil. Enjoyed this tip! You said that after you use one wipe that you put it into the washer and dryer. Is that immediately? Or, do you wait until you have enough wipes or other items that can be washed together. I’m seeking clarification about how often and quickly you’d need to wash the wipes, but making sure you have enough items to make at least a small laid of wash. Lastly, what did you mean when you stated…. “When you introduce water into a product without a preservative you always run the risk of introducing bacteria, so use water-based products quickly “. What would an example of this be? Hey Ebonie, I toss the cloths in the washer after cleaning with one, and then run the washer when I have a full load of clothes. Mold is a probably the most visible example, and one that many of us have experienced in our bathrooms (a perfect breeding grown for bacteria growth). Natural yeast is another example (a sourdough starter is a perfect example of how just water and flour attract yeast from the air and encourage bacteria growth–which isn’t always a bad thing in this case). Hi Kristin, I love this idea. Since I stopped buying the chemical loaded antibacterial wipes, my toilet has been a little neglected! So this is a great solution. It’s also a great way to use up old tea towels reusable baby wipes. A quick question though; would adding vodka be of any benefit for antibacterial purposes do you think? Hey Natalie, I’m so glad this will work for you! I would just spray the toilet with 100% hydrogen peroxide after you’re done using the wipe. The vinegar does act as a disinfectant, so that ingredient alone will get the job done. But if you really want some extra POW, then the hydrogen will help! Hi Kristin. Can I use these wipes all over in house. I mean kitchen contours, bathroom sink area, toilet seats and disinfecting door knobs, light switches. Thank you. Hey Rajwinder, Yes, you can. this are awesome tips, thanks for sharing! <3 i have a question though, do we really need to use the three essential oils or can we use just one? I made my own lemon essential oil and can't spend on buying the other two. thanks for the help! Hey themaskwriter, You can use just one essential oil, if desired. It’s me again. Just wanted to ask if you have a recipe for a wood polisher? I can’t seem to find one in your blog. My dining table is wood. What would you recommend or what do you use for cleaning wood? Thanks a lot. Hey Rose, I do, it’s in my cleaning book. I can email you that recipe, if you’d like. Oh please do so. Thank you very much. And I do hope you don’t mind if I ask a lot of questions. I’m just starting and trying to learn how to go DIY and natural. Absolutely, Rose. I’ll get that recipe sent over later this week/beginning of next week. Does the essential oil just sit at the top??? So do you have to shake it everytime??? Hey Paula, Yes, it will. You can shake the jar before use, or add a small amount of rubbing alcohol or glycerin to the jar first, with the essential oil, then add the remaining liquid to help disperse the EO. Is it possible to add vitamin E oil to the mix as a natural preservative? I have noticed it’s in a lot of natural DIY skincare to keep longer (and anti-aging). Thanks for sharing this wonderful zero waste idea!! Hey Lindsey, Vitamin E isn’t a preservative. It does keep oils from going rancid when they sit for a long time. I personally wouldn’t add it to this recipe. You could add a preservative, though. Thank you! I did end up finding your article on natural preservatives and it was super helpful and informative. There are tons of recipes for homemade lotions and no one talks about bacteria growth! Thanks for doing the homework for us! Thank you so much for this lovely recipe! I was just thinking about making some sort of wipes for when I’m in a hurry or just don’t feel like taking out my spray & grabbing towels. Plus the rest of the family will pitch in if it’s easy! I also normally use a lot of white wash cloths as cleaning rags (because I used to use bleach & so they had to be white!) But since breaking up with bleach I have found having a ton of multicolored towels is the best!! It makes me much happier to clean up. I’ll definitely be making these soon! I really love your website and appreciate all your help in “cleaning up” the lives of myself and so many. Thanks again, many blessings! Hey Patti, I just wash my clothes after each use in hot water in the washing machine. They clean up well and are ready to reuse again. Hope that helps! Hi Kristin, so happy to have found you! Really enjoying all the wonderful cleaning recipes (have made two already) and only found your page today. Do you have a recipe for a spray furniture polish? I was gifted a homemade orange oil furniture polish which has been just fabulous but unfortunately l have no idea how to replicate it but truly would like to make something similar… any guidance you could provide would be greatly appreciated. Thanks again for such an inspiring website ?